"Råg I Ryggen" was a Swedish Heavy Progressive Rock band formed in the Stockholm suburb Bromma in 1971,and after some line-up changes did their first gig three years later. The group explored a brand of music highly influenced by acts like "Uriah Heep" and "Deep Purple", yet also incorporating musical elements by more sophisticated outfits like "Jethro Tull" at times. In 1975 they released their sole album "Råg I Ryggen". Four of the songs have Swedish lyrics, the remaining three are English. Of particular interest are the tracks "Sanningsserum" and "Det kan väl inte vara farligt", which perfectly display the band's raw progressive style. 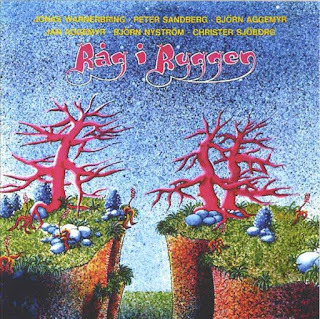 "Råg I Ryggen" they did one of the best progressive albums from Sweden and is much sought after by collectors as well as fans. Warnerbring and Sandberg left the band in early 1976 and were replaced by Lantz and Edgren, but the band did not last long.